Why should I pick your education consultancy? We have been active in the International Education Consultancy sector for over a decade. We are also the first Nepalese education consultants to operate in Melbourne. Our goal is to provide professional, honest and reliable information to all our clients. Since our inception in 2006, we have served thousands of students. A large number of our students have now finished their studies. Many are living and working in Australia permanently. No matter what your goal is, our job is to help you to realise it. Students are more than just numbers in our ledger. When you use our service, we give you a tailored education plan. We help you pick a course and walk you through the enrolment process. Our partnership with a range of education providers means that you will have more choice when you deal with us. As your representatives, we can also liaise with your college if needed. 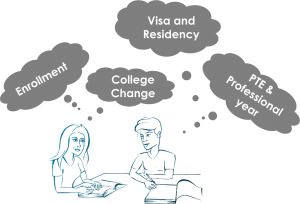 Once you complete your studies, we can help you explore career and permanent residency options. We also have a registered migration agent on-site. Below is the list of services available for International Students. How much do you charge for your service? Our education consulting service is free for students who enrol with us. We also don’t charge when you visit us in the future regarding your studies. We welcome you to visit your nearest office or contact using the form below.